First tomatoes – Mumma, Did You Know? Please excuse the slightly dodgy camera phone images but I’ve decided that if I don’t take a quick snap and then upload before I get distracted, then it may not happen. 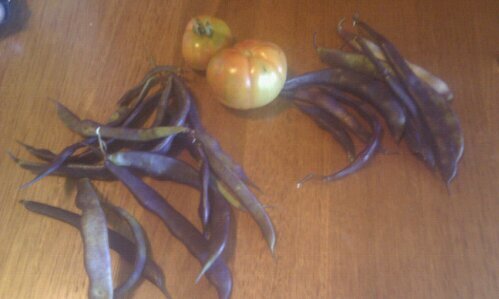 I did have the tomatoes and beans posed on the table last night next to the good camera, but the photo didn’t happen, so a quick snap away with the camera phone, and success. 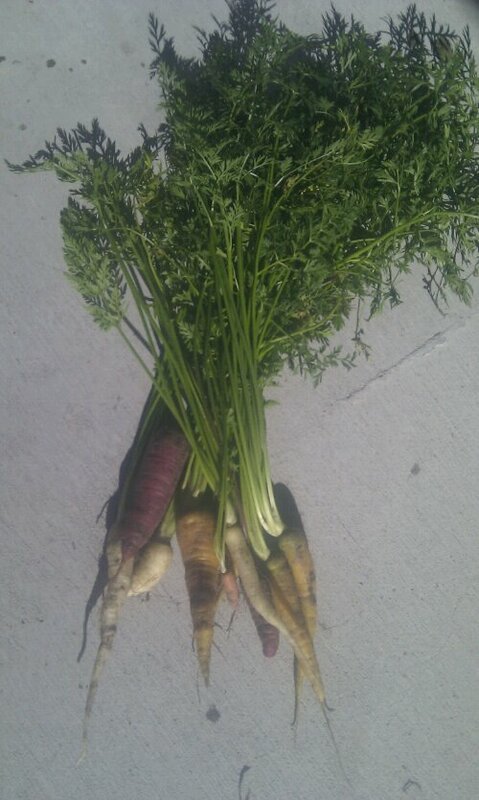 This morning we have been out to the garden and harvested more carrots. I really like this colour mix. I’m in the process of pulling everything except the tomatoes and my giant sunflower out of the garden to make room for more plants, and I’ve decided to plant carrots again. I have purple Dragon carrots and some more colour mix leftover (both from Green Harvest), so hopefully we’ll have further success. I’m also planting at the right time this time, so they should grow a bit faster. Yesterday we spied the first of the tomatoes ripening. I pick them when they’re yellow turning red, otherwise the birds or bugs or possums get them. I think it’s the birds, if it was possums I suspect we’d have no tomatoes at all. Then they set on a windowsill while they ripen. Felix has already taken a bite out of the big one. I pulled out all the beans so I can replant the bed over the weekend and found more beans left on the vines than I thought there would be. The ones on the left are small and good for eating still, while I’m hoping to dry out the beans on the right and use the seed next season. I will probably plant more beans this weekend but I have bought seeds leftover, so I’ll use those up first. I also picked a little bit of rosemary to use on another focaccia bread, so I’ll see how that goes. I should probably dry some rosemary out to use in cooking. I also need to get a proper herb garden established at one point but with all my plans for the backyard, I’m trying to hold off establishing any new garden beds until I have a proper plan in place.